Can you remember how much you raised for this lot back then Ian. Would be worth a good few quid today that's for sure some real Bertie's in that lot. I think I raised about £2,500 from memory but that was quite a lot of money back then (the average wage was probably £50 a week then). I haven't had the heart to add 'em up at today's prices! What a fantastic set of records. I'll take the Matt Lucas if you still have it? Doubt anyone will ever see the Salvadors, Tobi Legend and the Professionals up for sale on the same list ever again and certainly not listed consecutively at the end of a list. Do you ever regret selling them Ian? No, not really. I mean obviously everybody would like to keep their collections intact forever but that particular collection got me to the U.S. for 6 months, got me into the music biz at a pretty good level, got me a million-selling record and introduced me to so many great people who I'll never forget. It also got me into the Motown library and numerous U.S. record collections and allowed me to travel all over the U.S. at the age of 21. Plus I managed to get most of those records back for mere cents plus thousands more in my subsequent collection, so arguably it was the best decision I ever made. Thank heavens your spelling's improved since then though! 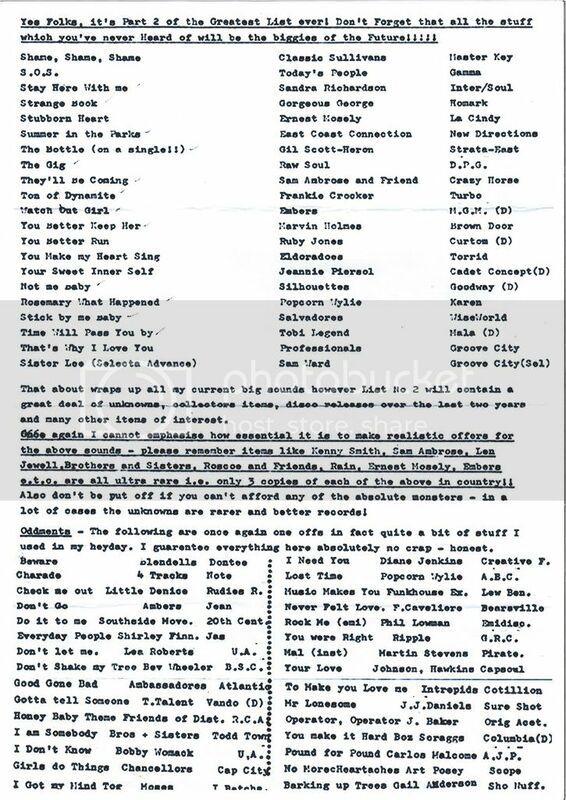 Great reading Ian.Pop the list in the NS 1975 Time capsule.!!! 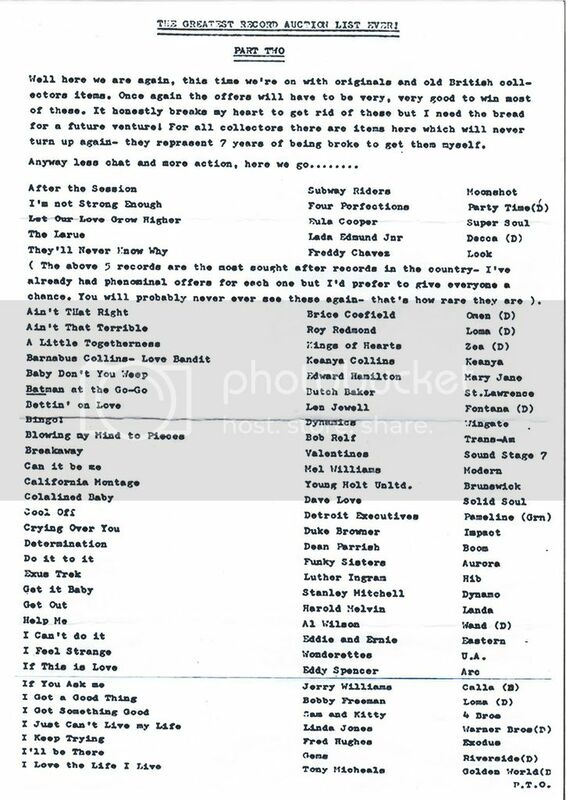 That is one mental list of rare soul……and, in 1976 ! Have you still got Billy Woods & the Del Larks …..
You know what Chalky? I never even thought of that. 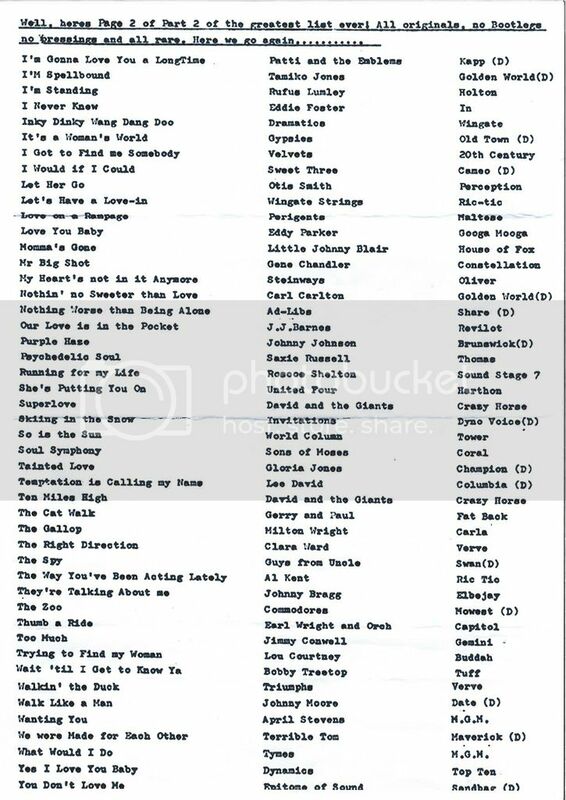 It could be that it was the first ever Northern Soul auction list, now I think about it. I can't remember any that pre-date 1975. Most lists up to then were fixed-price. Oh my God. What did I start....? Can you remember any of the prices you either bought them for or sold them for please? 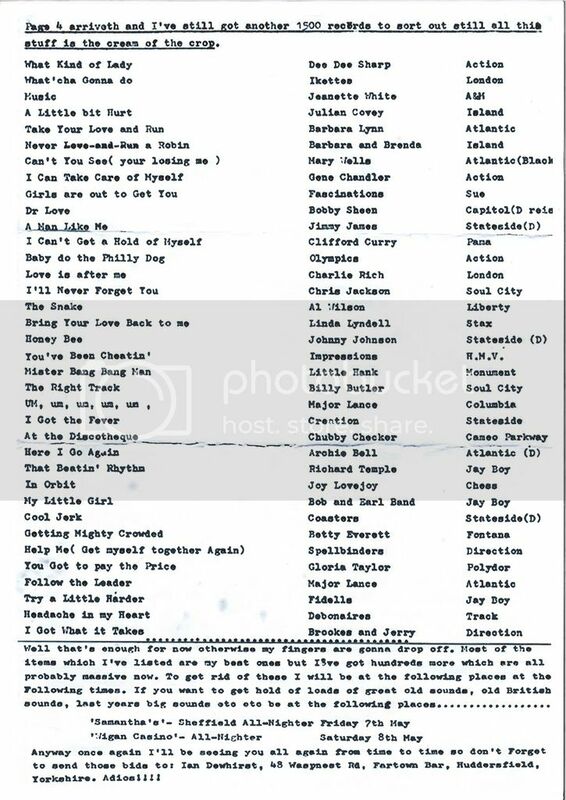 I kept re-reading the list - Diane Jenkins and Bobby Womack - May 75? 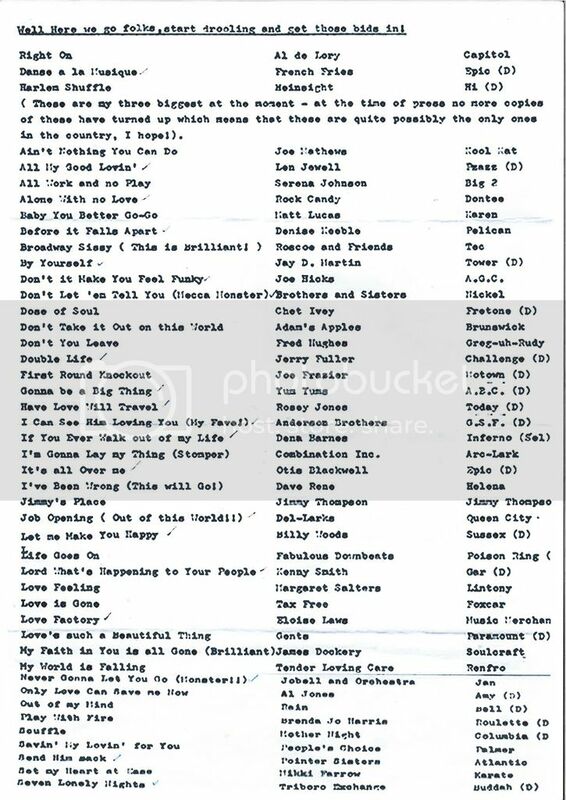 Then I read the intro on the actual list - 3 May '76!! ps Ian - I pm'ed you on another matter but I don't think you have read it! I had nights-out over there that cost me at least a Billy Woods or Del-Larks! 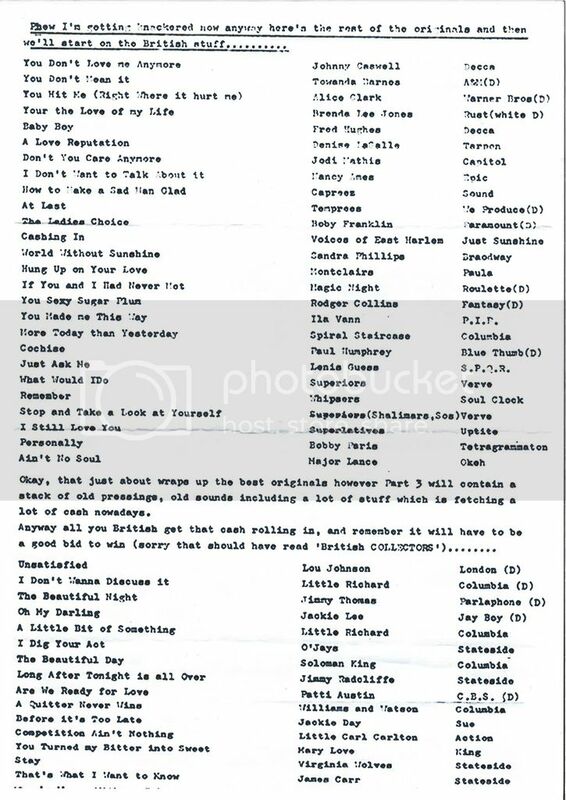 I remember getting lists from somebody who called themselves 'Soul Control' in 1971, they used to auction records but I don't think anything went for more than about £2. Well, the most I ever remember paying for a record back then was £40 which was for the Tomangoes. Most of the records on that list were bought from 10p to probably £5 or £10 quid. Prices were beginning to rise and I was finding it increasingly more expensive to even buy 'unknowns'. I was doing Wigan, Sams, Cleethorpes and the Central most weeks plus all-dayers every Sunday and other spots dotted around, so I was fairly high-profile so that always added a premium if I wanted a record badly enough. I bought Al De Lory as an unknown in Peterborough and that cost me £12 which I thought was expensive at the time. And the bloody rest to buy them now! I dare not add 'em up Julian. Looks like maybe £100K or so...? Four Tracks - Charade ! You had great taste mate to see that one in the future, 40 yrs down the line and still a cracker ! Also the Intrepids as an unknown,what a record ,still underplayed? As a kid at the time, i used it as a bit of a bible for a bit. I'd completely forgotten about that Intrepids track until I re-read the list. Just reminded myself of it on You Tube and stunned to see it on a pre-Cotillion label.......great name for a label though! Actually, that Heinsight record sounds better now then it did back then. A nice funky approach to an all-time classic which would probably sort today's audience more than the mid 70s one. Ive still got that somewhere will try and dig it out. The typing was pretty immaculate Ian - did you do this? 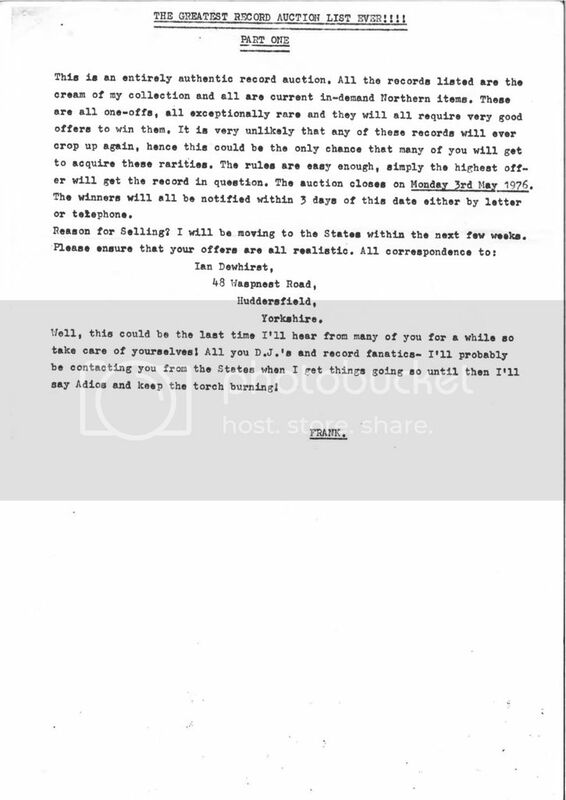 To achieve this standard of formatting on a word processor today, still needs a bit of skill.